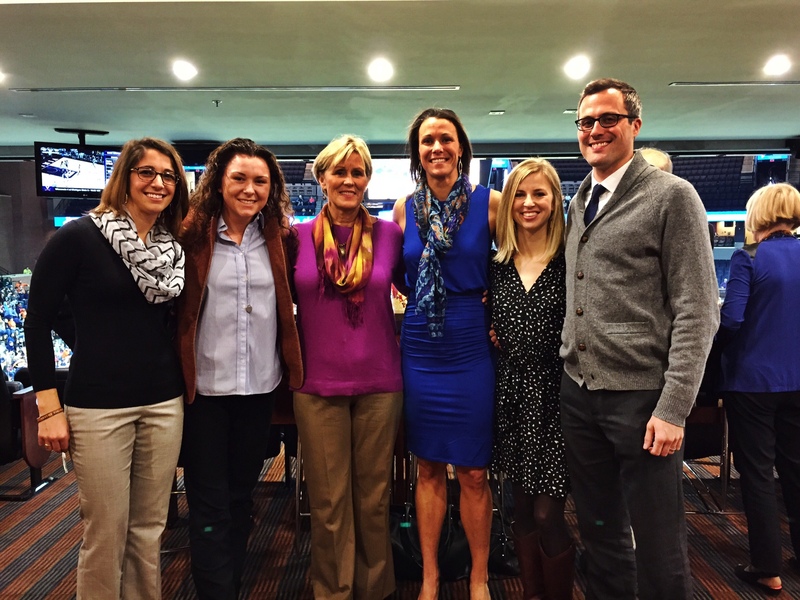 This past weekend (January 25th), I had the honor of being recognized by the University of Virginia as part of their 2015 celebration of National Girls and Women in Sports Day. (The National Day is recognized on February 5th, 2015). My trips back to Charlottesville are always special, but this one was especially memorable. 2015 National Girls and Women in Sport Day. Hanging out with friends and family in the President’s Box at the UVA Women’s Basketball Game. After torturing myself on a hard end-of-week erg workout Saturday morning, I jumped on a flight to travel across the country, from San Francisco to Washington, D.C. I guess you could say my sprint across Dulles Airport was my “flush workout” as I bounded up to the gate, sweating and panting, just in time to catch my connection to Charlottesville. The weekend was perfect. There to celebrate the weekend with me were my mother, my twin brother and his wife, one of my best friends from college, and several of my great friends and mentors who are still in Charlottesville. The Athletics Department, Virginia Athletics Foundation, and the Maxine Platzer Lynn Women’s Center put on an amazing event. I was truly made to feel quite like a celebrity and was extremely honored and humbled to be recognized as this year’s honoree. I’m writing this post not to showcase my own weekend but rather the event itself. To be completely honest, I knew very little about National Girls and Women in Sports Day before being chosen as this year’s honoree. As I learned more about the day and all that it is about, I couldn’t help but be grabbed by its significance. As I stood up speaking in front of a large and diverse crowd which included women who fought and struggled to even participate in sports years ago, juxtaposed against young girls who finally, have opportunities to compete and experience the benefits of being an athlete, it struck me how important a day like this was. There is still so much progress to be made, but in that room a story of struggle, sacrifice, and finally victory could be seen full circle. 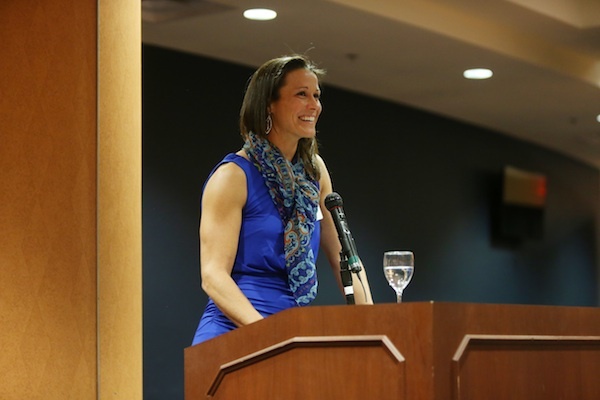 Giving my speech at the 2015 National Girls and Women in Sports Day celebration at the University of Virginia. I did my best to do the day and the people there justice by honoring them with a few inspirational words, but truly it was the experience that inspired me. I left the weekend feeling prouder than ever to be a University of Virginia graduate and more importantly, a female athlete. Below, I’ve shared my written speech and video taken of the speech from the weekend. For all of the younger athletes out there, remember to never take any game or practice for granted. And for the mature and “wise” athletes, simply, thank you. First, a big thank you to everyone in this room–all of whom represent or in many cases, are the people that have been an invaluable part of my story and reason that I am back here today. The University, Department of Athletics, the VAF, University faculty and staff, the Jefferson Scholars Foundation, and of course my teammates, friends, and family. A special thank you to the Maxine Platzer Lynn Women’s Center for co-hosting such a wonderful event in recognizing National Girls and Women in Sports Day, and most importantly helping me get a free trip back to Charlottesville during restaurant week. When I found out the theme for this year’s event, I was immediately excited. “Bold in the Pursuit of Excellence.” I’ll argue that this should be the theme every year, because all of the female athletes coming out of UVA can be identified by this. So in preparing for what I wanted to talk about, I considered the meaning of the phrase. The words passionate and fearless come to mind. For as long as I can remember, my life has been intertwined with sports. From the time I could walk, I was throwing or kicking a ball and trying to run faster than anybody who would line up next to me. While growing up, my family moved around a lot, and my most critical decisions seemed to revolve around what AAU or travel ball team I would be able to join. Even as a 10-year old, I wanted to find the best team with the best coaches and compete in the best leagues. I wanted to learn, to be challenged, and simply to be the greatest at whatever it was I was doing. This love for sports fostered an incredible drive and competitive spirit–passion–that opened up a world of opportunity off of the playing field. While it may have caused a temper tantrum or two when losing in a family game of Monopoly, more importantly, it drove me to give back to my community, to become Valedictorian, Student Council President, and eventually, a two sport athlete and Jefferson scholar at the university of Virginia. Through my involvement in sports, I learned that with hard work and determination, anything is possible. I vividly remember writing down my goals in the second grade: I dreamed about going to the Olympics. I would record any women’s athletic event that came on television–using up countless VHS Tapes–some of you in this room don’t even know what those are–and watch the games over and over again. I had female athlete role models. The magnitude of that is so important. While my brothers had posters of Michael Jordan and Emmitt Smith on their walls, I idolized women like Mia Hamm and fellow Wahoo, Dawn Staley. As a young girl, I was allowed and encouraged to want to become a strong, powerful, and successful person. Athletics gave me the confidence to dream big and pursue nothing short of excellence. To be fearless. To be bold. My time at the University of Virginia only strengthened this zeal for greatness. It was a perfect fit. My experience especially as a student-athlete equipped me with the skills and confidence to be brilliant, take risks, overcome the steepest of challenges, to always strive for building the best version of myself and to never settle. I had no choice but to keep up as I was surrounded by the best of the best: top students, elite athletes, and the greatest professors, coaches, and support staff in the country. Upon graduation, I continued a life wrapped up in sports. I began a career in the sports television industry, landing my first job with ESPN. It wasn’t until a couple of years later in the summer of 2010, while working and living in Connecticut, that I attended my first rowing lesson at a small club on the Connecticut River. Now to explain the sophisticated process of how a softball/volleyball player from Baton Rouge, Louisiana (where you do not get into small boats in the water) would fall into such an extracurricular activity: I literally, Googled “rowing” and “Hartford, Connecticut.” After one day on the water, I fell madly in the love with the sport. It occurred to me on that same day that I didn’t want to just do this a few times a week, recreationally. What if I could do something really big with this? So I threw a chunk of my savings into buying a boat and made plans to race in every race I could get to the following summer. After just one year of rowing, I was invited to join the United States National Training Center. A couple of years later, I quit my job with ESPN, knowing this type of journey took full commitment. Some would call emptying your savings, quitting your job, and chasing a dream with an unpredictable outcome “bold” and “fearless” — others may have a different genre of words for it — but nonetheless, I had an unbelievable support network and the confidence built on my experiences as a young athlete and as a Cavalier, that I could take on any challenge and succeed. It should be mentioned here that UVA has continued to play a significant role in this journey. When I first began rowing, I called Head Women’s Rowing Coach Kevin Sauer, seeking his advice and guidance. His first response was, “oh, now you decide to try rowing! ?” followed by “I’ll help you in any way I can.” And that he did. Today, I consider him one of the most influential coaches in my career and have become a big supporter of the rowing program here. Flash forward another couple of years and I am a two-time U.S. Women’s National Rowing Team member en route to hopefully competing with Team USA at the 2016 Summer Olympics. If you asked me in my First Year at UVA where I saw myself in ten years, my answer wasn’t “training for the Olympics,” but it was undoubtedly something equally as bold. It turns out that the little softball player in second grade knew what she was talking about. It would just be in a totally different sport. I am truly honored and humbled to be recognized by the University of Virginia as a part of this year’s National Girls and Women in Sports Day celebration. The role athletics has played in my life is invaluable. From my youth to my years at UVA, to continuing a professional career in sports, athletics have shaped me and made me the person I am today. Beyond the endless gratitude I have for my teammates, family and coaches, I am forever indebted to those women–women like my mother and Jane Miller–who years ago dared to dream and took those bold steps to challenge the status quo, paving the way for young girls like me to have the chance to play sports just like my brothers did. I only hope that an increasing number of girls and women continue to see greater opportunities through involvement in sports, empowered by the realization that they can be strong, they can be fearless, and they can be anything they dare dream to be.